Possesses a tall, lean frame with a long set of arms and a lot of growth potential. Exhibits some natural width through his lower half and should be able to continue to fill out. Isn’t a real natural bender though. Has a tough time sitting into his stance, staying low off the football and really keeping his base under him into contact. Doesn’t eat up a ton of ground off the snap and lacks the first step burst to consistently be a threat to the corner. Uses his length well into contact and when on the edge showcases some coordination to jab with his inside hand and work a club/arm over in order to slip the block and get around the corner. However, isn’t overly fluid when trying to turn the edge, gets upright and looks tighter, but uses his length well to make himself big and wrap. Gets upright as a bull rusher, showcases some natural power to his game, but exposes his frame and struggles to gain leverage. Drops his head into contact, but is routinely the higher man. Has the length and power to get away with it at the college level but will be stonewalled in the NFL. Isn’t real sudden laterally and doesn’t showcase a real quickness about his game when setting up a counter. Is upright, looks tighter and doesn’t have much change of direction skills. Plays upright vs. the run game as well, fails to consistently gain leverage and doesn’t extend his arms well into contact. However, has the natural length to extend when engaged in order to create room for himself and shed. Showcases good range for his size off his frame in the run game and can chase off his frame and use his length to close in pursuit. Lacks ideal anchor ability, but because of his natural strength and length makes it tough for opposing blockers to stay engaged. Missed time this season with a knee injury and will need to check out medically. Impression: I love his size and length. But I worry about defensive lineman who play upright, lack a great get off burst and struggle to change directions. I don’t see him as a big time pass rusher. But if he improves his pad level he could mature into a potential starting option. Has prototypical size for the position…has long arms and a good build…does a good job with his get off on the snap, it allowed him to get around the OT…he’s a passionate and unquestioned leader on the field…tackles well, making sure to wrap up the ball carrier…shows some nice power off his bull rush…has some decent hand coordination with both his punch power and placement…has a lot of potential thanks to the ability to grow into his frame and use his size…has plenty of pedigree as his one brother play DE for the Baltimor Ravens (Arthur Jones) and his other is the UFC Light Heavyweight Champion (Jon Jones). Not quite sure why he left school early…extremely raw in terms of his fundamentals…can almost always be located on film because he plays so high…has a good first step but isn’t an explosive edge rusher…stiff hips with limit his scheme fit to a 43…does not work very well laterally down the line of in space…struggles to change direction and can be shook by ball carriers who are shifty…has the length to control the blocker at the POA with his arms but has not learned how to do that consistently…gives up his chest plate too easily…questions will linger around his knee injury. 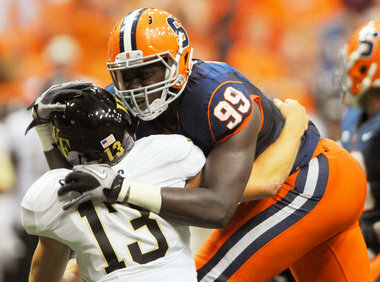 It has been quite a few years since Syracuse had a legit defensive end prospect, but Chandler Jones is next in line and will look to carry the torch for Dwight Freeney (who is now entering the end of his long and productive career). Jones has great length and the right size for a natural 4-3 defensive end. He could add a little more strength and bulk to his lower body, but he’s a well-built guy with no big concerns in his game. Like most college prospects, small tweaks to his game will really help him out. Jones needs to stay low and keep his leverage. This is achieved through a more natural or “springy” knee bend. Needs to better utilize his length, whether it is taking longer, more powerful steps off the line or engaging his long arms into his blocker. His pass rush is a bit unrefined, but these strategies can be cleaned up through coaching. Blockers can typically push him upright and kill his forward momentum; that is a bit of a concern for scouts. Jones doesn’t have a great burst, but the blueprint for a good starting defensive end is there if he continues to work. Chandler Jones is a tall, long, athletic defensive end prospect, who needs some work. Left as a junior, probably not his smartest move. Has technique flaws, most of which can be corrected. He’s a developmental prospect. He has the body and, I think with time, the skill set to be a starting defensive end. But he is not ready to play right away. One of the best things about the Giants is that they have the ability to develop someone like this. In the 4th round or so, taking Jones and letting him learn from the best isn’t a bad option. He desperately needs to learn how to play lower. With time, I think he can. As a mid round pick, not awful. But expecting him to contribute right away is a bit optimistic. Does anyone know if C. Jones is more comparable to Justin Tuck or Chris Canty at this point in their careers coming out of college.